This premium enclosure is designed specifically to fit and protect your Raspberry Pi Zero. It features a removable lid for connectivity of the GPIO connector. The stylish design incorporates a premium high-gloss finish, and the official Raspberry Pi logo embedded on the top. 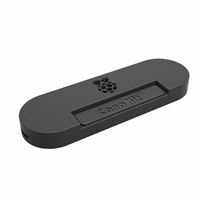 It is compatible with: Raspberry Pi Zero, Raspberry PI Zero W.